The scarf is one that I have lusted for since I saw it in Stella & Dot’s Fall 2014 preview a few weeks ago. I’m glad that I don’t have to wait until fall to wear it because the colors are perfect year round. It’s got that very trendy, Anthropologie-ish boho look with it’s mixed prints yet it’s very chic looking. I’m in love and plan to wear it at least weekly (especially in fall and winter) because it’s so versatile. I’ll show you more ways to wear it below. It wasn’t until I got home from the festival that I realized I could have also worn my scarf as a vest (I often wear my scarves like this as a swimsuit cover-up). I love this because it looks bohemian and has the same feel as the current kimono trend. What are your favorite ways to wear scarves in the summer? For more Outfit of the Day inspiration, check out my What I Wore posts. To see what other stylish bloggers are wearing, visit What I Wore Wednesday. Thank you so much! The scarf can be found at stelladot.com/CharmedValerie (it’s my fave SD scarf evah!) and the lippie (I linked above) is MAC ‘flat out fabulous’. Your scarf is so pretty! 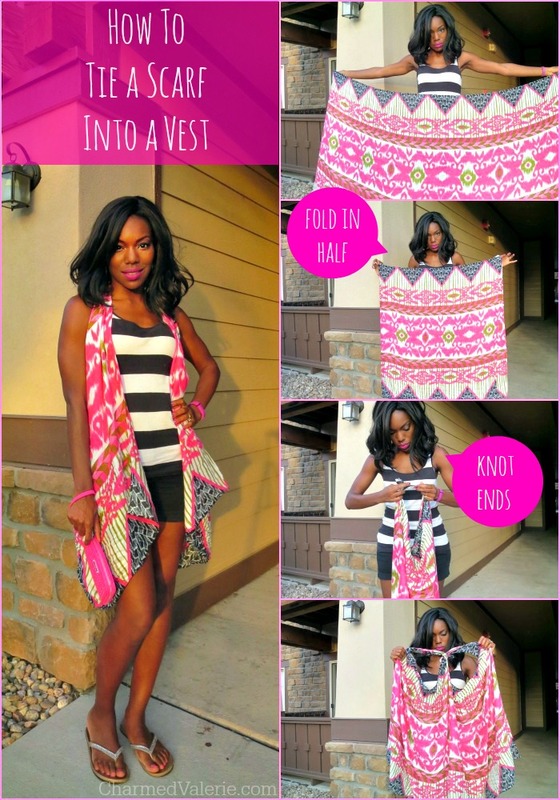 Styling it as a vest is so creative and it looks great with your outfit! I love ethiopian food and I love what you did with that pretty scarf. I always buy scarves and then never know what to do with them. Thanks for sharing! I love the way you’ve tied the scarf in the “neck tie”; it really adds a nice touch without being too hot! Very cute outfit, too! Btw, stopping by from The Pleated Poppy link up! I love that your lipstick matches your scarf. You look fabulous!! Also, I never would have thought of turning a scarf into a vest. Great tip, thanks.